Here is the second thank you card post of the day. I have painted the background with stampin up's dark blue ink in ombre style. I stamped, colored the images with Abandoned Coral distress ink on vellum. I then cut them and used the embossing tool to curl up the petals. Vellum flowers are then adhered on coral and red cardstock flowers to keep the brightness of their colors unaffected by blue background. Addition of partially embossed stitched frame was an afterthought which seems like was not a bad idea. I embellished the panel with diecut flourishes, silver foiled leaves, red enamel dots and a stripped banner piece. 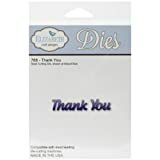 I diecut 'thank you' in white and navy cardstock and layered them. Lastly, I attached the whole watercolored panel on navy blue cardstock and then white base. So gorgeous! Love these flowers and how pretty they pop against this background!